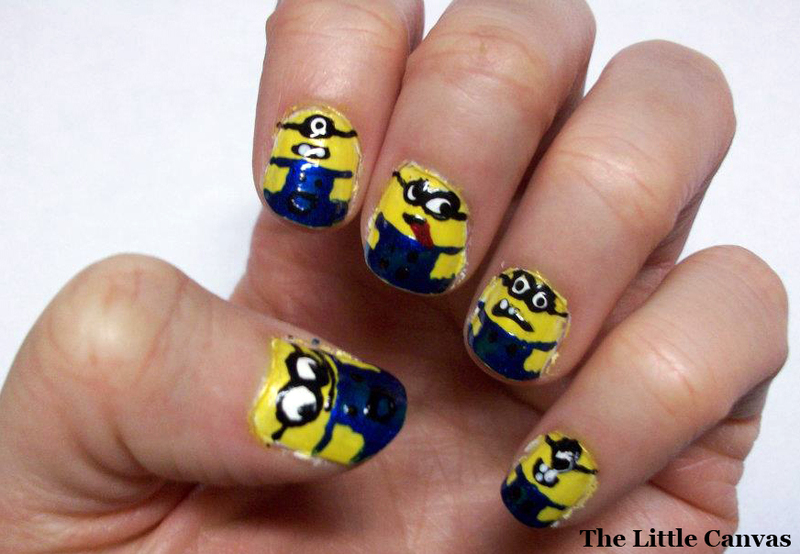 This is an old mani I did awhile back, but I'm currently watching Despicable Me and I had to find the picture of these lil guys. Please excuse the messy edges as this was one of my first designs when first starting out. They're also messier because I had to use a white base since my yellow isn't as bright as I would like when on the bare nail. One friend said to me "When you're typing, it's like your minions are writing your papers for you." Who doesn't want little minions doing their homework? I was actually surprised how well the lil guys turned out. At the time I did this mani, I did not own a dotting tool. All details were added using toothpicks. I have to say, I much prefer using toothpicks for my designs. I feel like I have more control. Now that I've had more experience and have been working more with polishes, I'm going to try these again, ESPECIALLY for the release of Despicable Me 2 in 2013. Yes, I am planning a mani for 2013 already and it isn't even summer 2012 yet. I doubt I'll be able to wait that long, so when another teaser trailer is released for the movie, the little guys will most likely be going right back on my nails. So, what do you all think? Good first attempt? ?